Raw Grain Free Pork, Bison & Pumpkin Dog Food | All Things Woof Meow, Too Inc.
Tucker's Complete & Balanced Pork-Bison-Pumpkin formula dog food is formulated to meet the nutritional levels established by the AAFCO Dog Food Nutrient Profiles for All life stages. 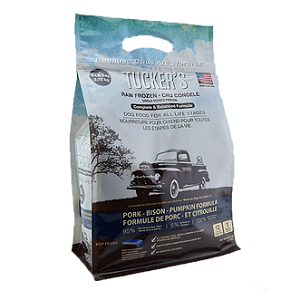 At Tucker's we believe that simple carnivore diets offer maximum absorption. This is why our formulas are 95% muscle meat, organs, marrow & bone with 5% natural pumpkin.